Take a ride underground with this rugged 2-in1 vehicle, featuring a classic yellow and black color scheme, detailed engine with moving pistons and spinning fan, and massive wheels with huge tires. Use the articulated steering to move into position, and then activate the versatile grabber to lift and load the heavy cargo. When you’re done shifting heavy loads, rebuild to create an awesome Mine Cutting Machine! Interactive, 3D Digital LEGO® Building Instructions app available online, for both models! This comes down to 12.59 cent per brick. 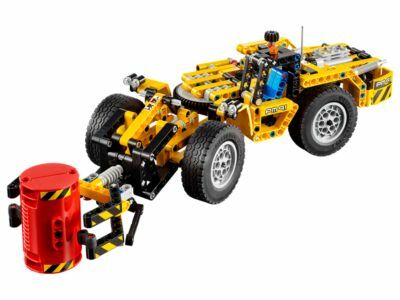 The Mine Loader (42049) Lego set is no longer directly available from the sites below. However, 3rd party partners of these sites might still have the set available. Alternate description Work deep underground with the rugged 2-in-1 Mine Loader, including a working grabber, articulated central steering, detailed engine with moving pistons and huge tires. Features a versatile working grabber, articulated central steering mechanism, detailed engine with moving pistons and spinning fan, large wheels with huge tires, and a detailed driver's cab with orange warning beacon. Check out the classic yellow and black color scheme. Grab the red barrel and load it up. Mine Loader measures over 3” (9cm) high, 14” (37cm) long and 4” (11cm) wide. Mine Cutting Machine measures over 4” (11cm) high, 15” (39cm) long and 5” (13cm) wide.